Video is taking Instagram by storm. Social media monitoring tool Mention reports that video posts have the highest overall engagement rate, getting more than 2X the comments of image posts. We’ve put together a guide to help you make the most of the trend towards video on Instagram. In this Instagram video guide, we’ll dive into all aspects of video on the popular mobile social platform. We’ll take a look at everything from video in the Instagram feed to Instagram Stories, ads, and live video. Jump around using the links in the Table of Contents or read through the full guide to get the full overview. 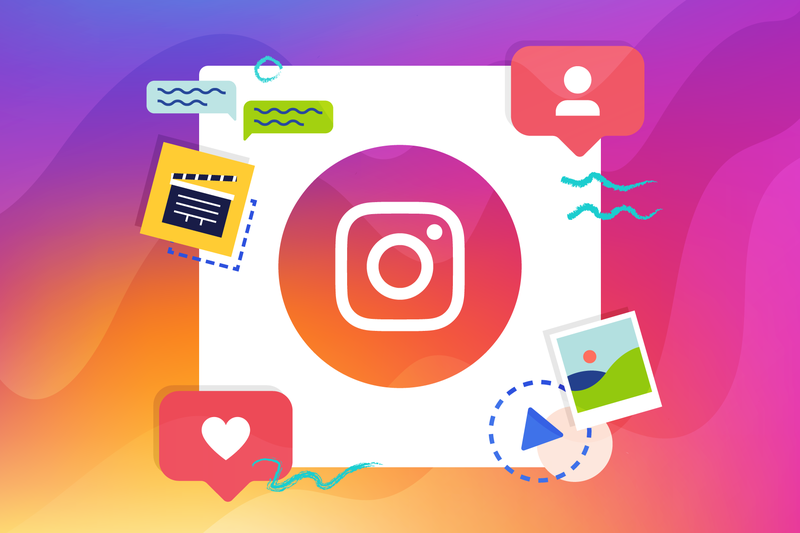 First we’ll talk about what we mean when we say “Instagram video.” Instagram video refers to a whole bucket of things, including Instagram feed, Instagram Stories, Instagram Live, and Instagram ads. Instagram feed video refers to the videos you upload to your main Instagram page, rather than to your Stories. These show up in the Instagram feeds of your followers, as well as on your main profile page. Instagram Stories are short photos or video clips, up to 15 seconds in length, that vanish 24 hours after posting. They don’t display in the primary Instagram feed. Rather, they’re showcased within a circle around your profile picture or at the top of your followers’ Instagram feeds. We’ll dive into more on Instagram Stories in this guide. However, if you’re interested in learning even more, check out our full Instagram Stories getting started guide. You can also stream live on Instagram. When you go live on Instagram, the live video will display in the same place as your Instagram Stories while you’re live. When you’re done, your live video will disappear unless you choose to share the replay to your Story, where it will live for 24 hours. You can also download it to repurpose the video later on. Instagram video ads are videos that you pay to get in front of a targeted audience in the Instagram feed. In addition to your video, they include a call to action (CTA) that lets you link back to your website where viewers can learn more or even make a purchase. Instagram video ads are set up through the Facebook ads manager. There are a lot of reasons to use video on Instagram. We’ve rounded up just a few, in case you’re not already convinced. As we shared in the introduction to this guide, Instagram video posts get more engagement than image posts. Mention reports that videos receive 2.1X more comments and have 38 percent higher engagement. But that’s not the only benefit of Instagram video. Back on a Facebook Earnings Call in 2017, Facebook COO Sheryl Sandberg shared some powerful insights, and some stats, that clearly illustrate the rapid growth of Instagram and why businesses should be investing in building a presence there. On the call, Sheryl Sandberg shared that, "As people and businesses shift to mobile, Instagram continues to grow quickly. There are more than 2 million active advertisers on Instagram, and we announced in November that more than 25 million businesses have profiles on Instagram—up from 15 million in July." Businesses are flocking to Instagram because they’re seeing success with it. But that’s not all. As millions of businesses get started with Instagram, the likelihood increases that your competition is there. If they are, you’ll want to be too. And if they aren’t, you’ll want to be there to stand out. Just as it became clear a few years back that businesses need to have a presence on Facebook because their consumers expect it and are searching for them there, the same is becoming true of Instagram. Sandberg reported, "About two-thirds of the visits to Instagram business profiles are from people who don’t follow them yet—and this is helping bring in new customers." Potential customers are seeking out businesses on Instagram. You’ll want to have a presence when they come looking for you—even if it’s just a handful of posts with a company description and link to your website in the bio. And what type of content is resonating with these consumers? Video, of course! 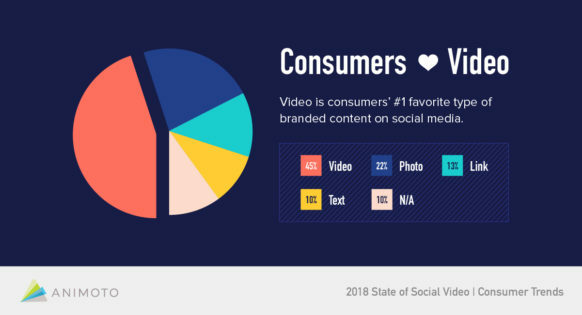 According to our recent 2018 State of Social Video marketer trends report, video is consumers’ #1 favorite type of content to see from brands on social media. In this section, we’ll cover the basics of how to share a video to the Instagram feed, to Instagram Stories, and as a video ad. If you’d like to take a deeper dive, we’ve put together an entire resource about how to post a video on Instagram. That article includes how to post your own video, how to repost someone else’s video, and how to post to Instagram Stories, plus video specs for feed and Stories. We’ll start with how to post a video to your profile, to share with your followers in their Instagram feeds. Make your video. Before you can upload a video, you need a video! Check out our article on how to make a vertical video for IG Stories using Animoto’s square video format. Save the video to your device. You can only create Instagram Stories from a mobile device, so you’ll need to save the video to the device you use Instagram from. Create a new Story. Tap on "Your Story" in the top left corner when you’re logged into the Instagram app. Upload your video. Tap on your camera roll and select the video you want to upload. Finalize and share. Add extra text of stickers if you’d like. Then, when you’re done, share it to your Story. Want to learn more? Check out our guide to getting started with Instagram Stories. Just like some potential customers may be seeking you out on Instagram, you can use targeted advertising to seek out potential customers as well. You can easily target just the right audience on Instagram using Facebook Ads Manager. Facebook COO Sheryl Sandberg says, "Targeting makes advertising better – more relevant to people and more effective for businesses. This is especially important for small businesses as they have limited budgets and need to make every dollar count. Facebook gives small businesses the same powerful tools that were previously only available to large advertisers – so they can reach the right people at the right time." If you’d like to post an Instagram video ad, the first thing you’ll need is a video. We’ll show you how in our article on how to make an Instagram video ad in under two minutes. Once your ad is created, you’ll get it set up through the Facebook Ads Manager. We’ll share an overview here. For a more in-depth look at Instagram ads, check out our article on how to reach new customers with targeted ads on Facebook and Instagram. Create your ad in Ads Manager. Head over to Facebook Ads Manager and click Create Ad in the top right corner. Determine your objective. What are you trying to achieve with your ad? You can choose objectives related to awareness, consideration, or conversion. Define your audience. Who are you trying to reach? Facebook lets you find an audience based on location, demographics, interests, behavior, and more. Check out our article on questions to help you target the right audience. Choose Instagram as your platform. You can edit placements for your video. For an Instagram ad, select either Feed or Stories, depending on where you’d like your video to display. Set up your ad. Choose your ad format, upload your video, and add relevant text, calls to action (CTAs), and links. When you’re done, simply click on Place Order. After review, your ad will begin. To make sure that the videos you create are the right format and size for Instagram, here’s a quick rundown of length and specs. Again, we’ll be looking at Instagram feed videos, Instagram Story videos, and Instagram video ads. Videos in the Instagram feed can be up to 1 minute long. You will be able to upload videos that are longer than a minute. However, you’ll need to select a 1-minute section to share in the feed. This is a good spot to point out that vertical videos in the feed are not the same aspect ratio as vertical videos in IG Stories. Instagram Story videos are taller, as they take up the full screen of a mobile device. Instagram video ads display alongside regular Instagram videos in the feed and in Stories. Therefore, the length and specs are the same for ads as for regular videos. Now that we’ve covered why you should be using video on Instagram and how to share videos on Instagram, it’s time for you to start making videos. Not sure where to get started? We’ve rounded up a few Instagram video ideas to help get the ball rolling. A weekly video series is a nice way to keep yourself accountable for posting regular videos. Plus, it provides an opportunity to reach new followers through the use of hashtags. A weekly series could be something like #TuesdayTips, where you share a tip related to your focus each Tuesday. Other weekly hashtags are #WomancrushWednesday, #FlashbackFriday, and #Caturday. Animoto shares #MotivationMonday videos each week, including other relevant hashtags too to reach a wider audience. We get into this more in our article on Instagram growth hacking. A weekly series like this doesn’t have to live only in the feed. Try it in Instagram Stories too! Share a quote or series of quotes that your audience would resonate. Again, share with relevant hashtags to get your video in front of a wider audience. If you need a little help, check out our Editorial Quote List video template. You can easily customize this video with your own colors, images, and quotes. Use Instagram to humanize your brand by going behind the scenes, whether it’s a business or personal brand. Show off your daily routine, how a product is made, what your office or home looks like, or anything else that gives a glimpse into who you are. Video ads are a great way to reach a new audience on Instagram and Facebook alike. Check out some examples of businesses that saw success with targeted ads in the video below. As we mentioned earlier in this guide, you can run video ads in the Instagram feed as well as in Instagram Stories. If you need a little help getting started, customize one of our video templates. Here’s a product intro template you can use to make your own. 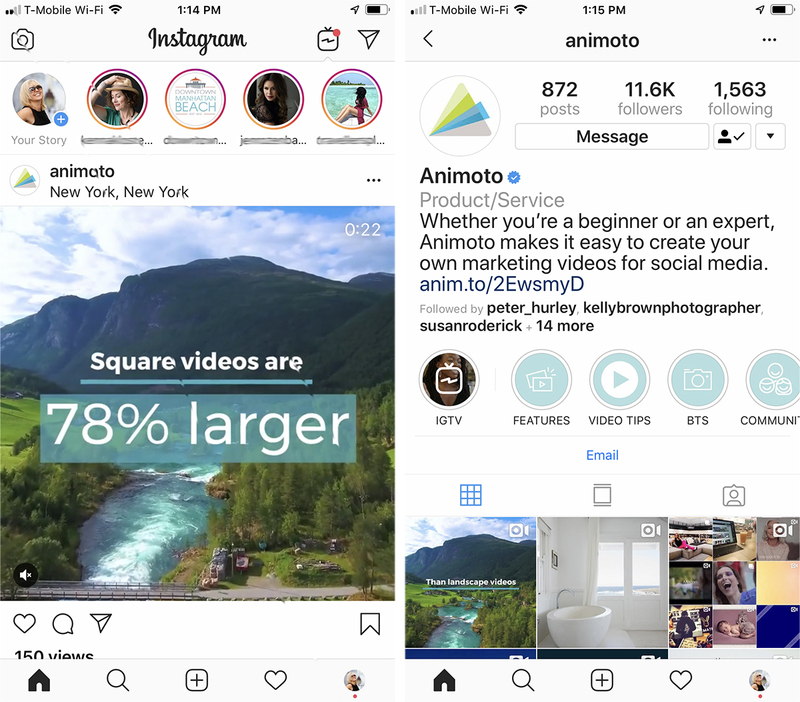 If you’re planning to run an ad on Instagram Stories, check out our blog post on how to create an Instagram Stories video using Animoto’s square format. Instagram Stories offer a suite of tools to help you engage with viewers, including asking questions and posting polls. As a result, there are lots of different and interesting things you can do with video. Q&A: Use the question sticker to let your followers ask you questions. Then, shoot a series of short video Stories answering the questions personally. Exclusive offer: Use the short lifespan of Stories to share a video with a “just for followers” offer. Share a promo code just for people who see your Story to provide a sense of exclusivity. 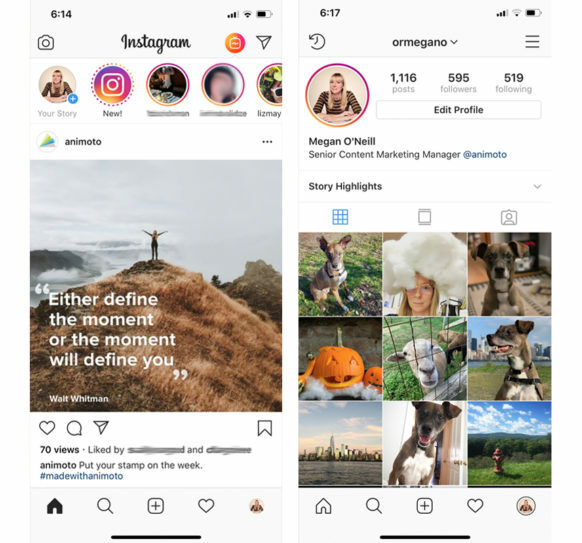 Highlight customers, followers, and fans: Your Instagram feed should contain on-brand content, but Stories gives you the opportunity to showcase user generated content and give your loyal followers a shout-out. Sneak peek: Show your followers a sneak peek of something you’ve got in the works, and even ask them for feedback or ideas to improve what’s coming. Hungry for more ideas? Check out our full blog post with ideas for boosting engagement on Instagram with video. Different videos perform best on different platforms. A video that works on YouTube may not be ideal for Instagram, just like a video for Instagram may not be the best content for Twitter. These tips are designed to get you thinking in the right mindset for creating videos for Instagram. To learn more about what your customers want on different platforms, check out our cheat sheet. Instagram was originally just a photo-sharing app and, as such, Instagram users are used to seeing beautiful, striking images in their feeds. In this example, Cupcake Market stood out on Instagram with bright colors and the visual appeal of their celebrity cookies and received attention from press, as well as an increase in sales. Check out their case study here. Think about the types of imagery that make you stop and look on Instagram. Do you have anything like that that you could include in your videos? If not, you can always use appealing stock images. A stock library of over 1 million Getty Images photos and video clips is included with an Animoto subscription. Instagram videos can be 1 minute. But again, since it was initially a photo-only platform, users have developed a habit of scrolling quickly on Instagram, so attention spans can be quite short. Because of this, it’s best to keep videos under 30 seconds. And remember, videos will loop and play again once they get to the end. Through $30,000 in testing, we learned a lot about what works on different social platforms. On Instagram, we found that inspirational content resonates with Instagram users. Animoto’s Chief Video Officer Jason Hsiao says, "When you approach video creation for Instagram, keep inspiration in mind. Start with compelling imagery, tell a story that inspires, share a quote, or show something interesting." Hashtags are the best way to get your content in front of an audience that’s not following you. We’ve outlined how to experiment with hashtags in an article on Instagram growth hacking in three steps. Our last tip is a simple reminder: Don’t forget to set a cover image for your videos on Instagram. The cover image is what shows up in the square representing your post on your Instagram profile, and what shows up before your video loads and begins playing. And once you’ve published there’s no way to go back and change it. Before you get to the final screen to share your video on Instagram, you should see options for "Filter," "Trim," and "Cover" at the bottom of your device. You can click on "Cover" and scroll through to choose a frame to set as your cover image. Need a little more instruction? Check out our how-to blog post for Instagram cover images. We hope this guide has helped you understand why you should be using video on Instagram as well as how to share videos on the platform. We've given you Instagram video ideas and tips. Now, it's time to start making videos—and we're here to make it easy. An Animoto subscription gives you everything you need to drag and drop your way to powerful and professional social videos. With customizable video templates, designed with success in mind, you can create your own videos in minutes. With over a decade in the industry and partnerships with YouTube, Twitter, Facebook, Instagram, and LinkedIn, Animoto is used by more than 1 million businesses worldwide. Try it for free today or learn more about using Animoto to make Instagram videos. Happy video making!